On the last season of Married At First Sight Au, only two couples made it through to the other side; Simon and Alene and Nick and Sharon. But then last month we were hit with the news that Simon and Alene had parted ways. They seemed like such a good couple, so obviously it was crushing news. But love may not just be dead yet, as the pair reunited with a few of their MAFS friends for a day at the races and it seemed to be more than just a catch-up! 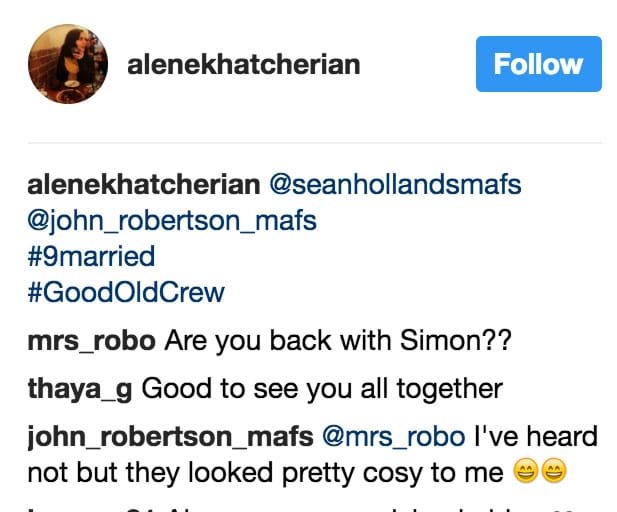 John Robertson, who was paired with ex-model Debbie on the show left an Instagram comment following the races that has us hopeful that Simon and Alene could give it another go. A fan commented on Alene's Instagram photo asking, "Are you back with Simon?" John replied to that fan saying he's heard they're not, "but they looked pretty cosy to me!" Fingers crossed that these two rekindle their romance!